A few days before I was scheduled to interview Paul Kelly, I happened to be in Newcastle, watching a singer-songwriter night in a quiet bar. 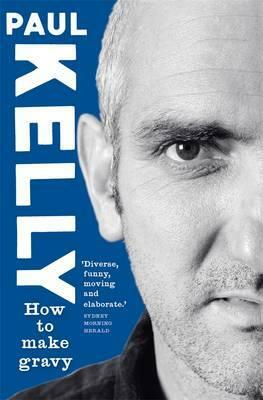 A rangy looking man stood up and performed a halting, anguished cover of Kelly’s song ‘How To Make Gravy’. In the lyrics, a man calls his brother from jail, just before Christmas. He passes on his gravy recipe, together with an extra serving of regret. It’s the kind of taut, empathetic storytelling for which Kelly has been acclaimed throughout a career spanning 30 years and two-dozen albums and soundtracks. In 2004, when the Spiegeltent first arrived in Melbourne, Kelly performed a series of special shows. Over four nights, he sang 100 of his songs in alphabetical order, and leavened the one-man act with a selection of stories. Audiences gobbled it up, and he later toured the format around Australia and overseas. How To Make Gravy follows the same A-to-Z structure. Each chapter contains the lyrics to a song, together with an anecdote. The result is something like a big, snug patchwork quilt, in which Kelly has stitched stories about his family history and song-writing, together with pop music lore, literary references, band travel yarns, and hard-won life experience. There are even occasional puzzles. In one sense the whole book is a list, an extended tribute to Kelly’s many collaborators and to his eclectic sources of inspiration, both musically and intellectually. The ‘Index Of People and Bands’ runs to eight pages of tiny type, and includes poets, playwrights, authors and activists, as well as musicians. As the chapters roll on, Kelly reflects on friends who’ve influenced him and those who’ve died, on aging and the passing of time. In the chapter corresponding to the song Winter Coat, he describes listening to a Frank Sinatra album in the dark on the night Ol’ Blue Eyes died. After surrendering to an overwhelming sense of loss and fading possibility, he emerged ‘refreshed by tears…and glad somehow to be sad’. Back at the singer-songwriter night in Newcastle, when the rangy singer sat down after performing the heart-rending cover, a punter approached him, bearing compliments: ‘Great song choice man – I love Paul Kelly. He’s a voice for the nation.’ ‘Yeah,’ the singer replied. ‘Everybody loves him.’ As I listened in, I could scarcely believe my good fortune. Michael Green is a freelance journalist (The Age, The Big Issue) and a Paul Kelly fan.